Why limit yourself to one celebration when you can have two? This year’s Super Bowl on Sunday, February 3rd is just a few days ahead of Chinese New Year, which begins February 5th. Make some of those chicken wings you’re serving Chinese style and get a little head start on the luck, good fortune, wealth, honesty, and prosperity that accompany the Year of the Pig. I found this recipe by Nagi on recipetineats. If you are a fan of Chinese style chicken wings, this is your recipe. The thick, sticky sauce is mildly spicy, and just the right amount of tangy/salty/sweet. Get out those napkins. These are some serious wings. Reading through the comments, I noticed that some of the readers who wrote in were opting to grill their wings. I wanted to try making them in the air fryer, but was torn about following the recipe as directed and using the oven. I asked my husband to weigh in, and what ensued was the most earnest, compelling discussion he and I have had since deciding where to put the TV in our first apartment. I am not sure if men take wings or grilling more seriously, but let’s just say a conversation involving both definitely had him engaged. Ultimately, we decided to make the wings all three ways: oven, grill, and air fryer, so that we could know, once and for all, which method works best. The recipe below is adapted for the air fryer. You can also make the wings in your oven if you want to by following Nagi’s original instructions. If grilled wings are what you’re after, I suggest starting the wings in the oven, cooking them for about 30 minutes, and then transferring them to the grill to finish them, continuing to brush on the sticky glaze as they cook. I used brown sugar and ketchup when I made this. I also used dry sherry as a substitute for the Chinese cooking wine (Shao Xing Wine). You can also use mirin, but if you do this, reduce the sugar to 1 tablespoon. All three methods yielded delicious wings, but the air fryer was the absolute, ultimate winner. The wings were crispy underneath and thickly lacquered with sticky sweetness, shellacking the other two contenders into submission. It is not too soon to get your game on. Get your wings and get ready. The Super Bowl is still up for grabs, but the wing winner is a shoo-in. Combine sauce ingredients in a large bowl. Place chicken wings in basket of air fryer and set temp to 380º F. Cook for 24 minutes, turning the wings over after 13 minutes. Remove wings from air fryer and add to bowl, turning to coat well with sauce. Using tongs, remove wings, shaking off excess sauce. 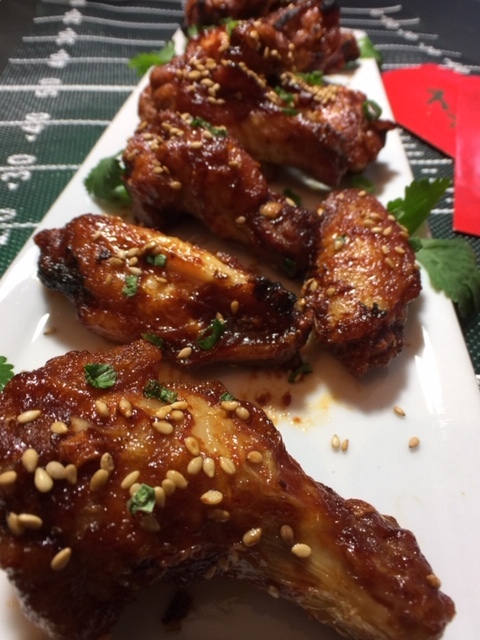 Return wings to air fryer, set temperature to 400º F, and continue to cook for another 6 minutes, or until sauce becomes dark red and sticky and internal temperature of wings measures 165º F. Transfer to serving plate and garnish with scallions, sesame seeds, and cilantro.